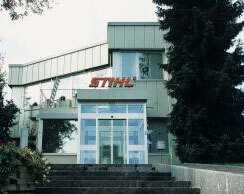 At STIHL’s plant in Wil, Switzerland some 700 employees produce chainsaws which are shipped worldwide. The site has implmented a contactless access control system from primion Städtler and Häfele using LEGIC contactless technology, Dialock Integra offline door terminals and a ZKSWIN software module. Primion Städtler software is used to administer all access authorizations for both employees and visitors. The ability to integrate several applications into one system and one database was a factor in opting for this solution. Primion Städtler’s ZKSWIN software module is used to implement this security/access control concept. The ZKSWIN Integra software module, together with Häfele’s innovative Dialock Integra door terminal, combines electronic access control with off line access control and dispenses with the need for door wiring. This made it possible to prevent the creation of isolated security “islands” in certain areas of the company. This link between ZKSWIN and Häfele’s mechatronic access components makes it possible to use just a single LEGIC credential for all the existing access and locking systems in the company.